A hissing sound is usually indicative of a mechanical issue with the internal working of the aircon. Any mechanical issues with this device should never be ignored. This is because the aircon, or air conditioner, has become an integral part of any home especially now when most people are aware of the impact of air quality on long term health. The presence of harmful particulates in the air that people breathe has been linked to countless respiratory complications and even to some forms of cancer. This is why even if the air conditioner ensures that the air people breathe is ideal and clean, it is important not to forget that mechanical issues with the aircon can end up hurting peoples health not only directly, but also adversely. The necessity of knowing how to detect and correctly diagnose the signs that indicate mechanical trouble in an aircon cannot be better emphasized when the above factors are considered. In order to acquire this vital knowledge, one has to first be in a position to identify the visible and auditory cues indicative of mechanical trouble. The most common and most notable auditory cue is the hissing that is often heard from the aircon unit. It is important to note that this hissing sound does have different levels of intensity. High intensity hissing is usually an indicative of a greater extent of mechanical damage to the aircon, with low intensity hissing indicating lesser damage. However, this need not be the case always as is demonstrated below. The aircon has a compressor whose function is to turn the low pressure refrigerating gas from the evaporator, inside a room, into a high pressure gas that then flows to the condenser located on the outside. The compressor is composed of a powerful motor that is able to force refrigerant into a thick-walled metallic chamber. More and more air molecules are forced into the chamber, which forces the refrigerant molecules closer together causing a rise in the temperature of the gas. This chamber is designed to withstand high amounts of pressure and temperature. However, with the passage of time, these walls can fail and crack. When the air inside the chamber is compressed beyond a certain pressure level, the temperature inside the chamber rises causing the crack on the walls to widen. The widened crack then lets the compressed gas to then leaks through the wall. This leak is what is responsible for the hissing sound. The high intensity hiss from the compressor is typically heard a few minutes after the compressor comes on. The hissing sound will be heard from the air conditioner unit located outside the building. The pipes through which the aircon's refrigerating fluid flows are referred to as the refrigerant lines. The fluid flowing through the lines from the condenser to the evaporator is usually in the high pressure liquid form. This line thus bears the highest pressure and is therefore the one with the highest probability of producing a leak. The pipe does eventually crack allowing the refrigerant under high pressure to escape thereby producing the hissing sound. This hiss is usually a low intensity continuous sound that is heard from one of the visible lines moving into the house from the condenser located outdoors. Compressed high pressure, high temperature gas from the compressor flows to the condenser where it is cooled to a high pressure low temperature liquid. The liquid then flows to the evaporator located inside the house. In order for the liquid to effectively cool the warm air going into the evaporator, it must be first converted into low pressure gas. For this to happen the high-pressure, low-temperature liquid has to pass through an expansion valve. It is at the expansion valve where the transition from liquid to gas takes place. This transition results in extremes of pressure across the valve which over time can cause the valve to fail. The failure is usually evident on the high pressure side of the valve. The result is a high intensity intermittent hiss that is usually heard a few minutes after the compressor powers up. The final candidates for hissing noise that might be heard from an aircon unit are the condensation and evaporator coils themselves. The condenser coil located on the outside of the home is the coil with the higher probability of developing a leak. This is because refrigerant enters and leaves this coil at high pressure. The evaporator coil can also develop a hiss after a prolonged service life. It is however a lot more difficult to detect a leak from the two coils as this tends to be masked by the humming of the fans. These fans are responsible for air circulation across the coils. The hissing from the condenser coil is however more detectable due to its higher intensity. In all scenarios it is not advisable for just anyone to try and stop the hissing from the aircon. The first reason revolves around the nature of the refrigerant. The chlorofluorocarbons that were initially used as refrigerants were phased out due to their link to ozone layer depletion. However the refrigerants currently in use do possess a certain extent for poisoning when inhaled. These refrigerants include sulphur dioxide, ammonia and gaseous alkanes such as propane and butane. 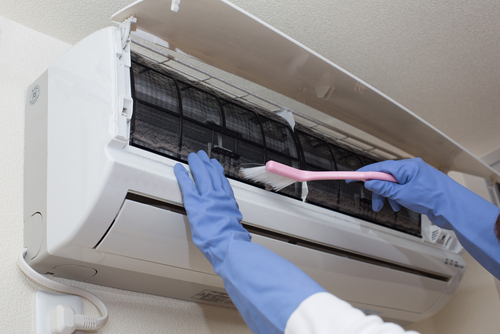 A person is required be in the possession of specialized equipment in order to handle an aircon. This equipment prevents of the potentially poisonous gaseous chemicals from escaping into the atmosphere. The second reason arises from the fact that the refrigerant is usually under high pressure and is either extremely cold or hot. This in itself is adequate to cause substantial bodily harm. It is therefore more prudent to seek the services of a qualified air conditioning technician when a hissing sound is heard from the aircon, than to try to resolve the issue by oneself.